In the last three years, I’ve become something of an amateur runner. I seriously love it! It started off while watching the Great North Run and challenging myself to do it. I haven’t done it yet but I have done a 10k, I’m booked for another, and try to do at least one park run a month. But that’s all by the by. At first, this appears to be a great quote. As a curvy girl who loves her food, it has taken me a long tome to love my body. This quote challenges me to love my bum and biceps as much as I love my eyes and hair. But then I started to really have a think about it. Because this quote doesn’t just encourage body-positivity. It encourages obsession. Google defines obsession as, “an idea or thought that continually preoccupies or intrudes on a person’s mind.” In other words, obsessing over what we love our bodies would mean that all we would think about is our bodies. To me, that seems just as bad as constantly think about what we dislike or even hate about our bodies. Either way, it is still an obsession that focuses on “ME” first and foremost. If Love is the Solution, Where do We Find it? The reality is that obsessing over how much we love any part of ourselves isn’t happy. It is either a promise we make that we cannot keep or in trying to keep it, the promise breaks us down till it is our only focus. So if the reality is that loving ourselves in our own strength will only lead to us failing ourselves, what is the solution? Because otherwise the world is looking pretty bleak. As Christians, we are meant to turn to the Bible for our answers. After all, Paul tells us that all of Scripture has been inspired and breathed by the Holy Spirit. So if we are looking for a source of love to replace our obsession with ourselves, we need to be starting with God’s Word to us. When I think of how much God loves me, there are two verses that I think of. Genesis 1:27 and John 3:16. You see, God’s love isn’t just a a sub plot in the Bible. It is there from the very start and is a continuous thread that runs all the way through. Yet these two verses speak of God’s love for humanity in such a way that it goes beyond simple love. It is unconditional and foundational for us human beings and Christians. In these two verses we get a glimpse into the heart of God. First of all, He made us in HIS OWN IMAGE! In other words, God made us to look like Him. How do we know that this means that He loves us? Because, quite frankly, you only make something to look like you if you love it. When you pick a profile photo, you pick the one that looks the most like how you want to look. If you draw a self portrait (I do not miss those art lessons), you want to do the best you can because you are drawing yourself. Even more so if you are making something 3D. You want it to be the best representation of yourself. Yet God made us in HIS IMAGE! Remember, we were made pre-Fall so when God chose to make us in His image we were not sinful at the time. We didn’t even know what sin was. So the fact that we were made in the image of God tells us that He loved us and cared for us from the start. As living, breathing creations in His image, we are loved by God in a way unlike anything else He has created. It is at the very foundation of what it means to be human. The thing is, we did fall and we do sin. So even though we are made in the image of God, we are broken and distorted versions of that image now. Yet Jesus’s sacrifice on the cross reminds us that God’s love has not changed. In fact, it isn’t just changed but it is unconditional! By dying on the cross, Jesus shows us how God is willing to go to the furthest lengths possible to make us whole again. He loves us too much to throw us away and start again. He even loves us too much to keeps us even though we don’t work properly. Think of your favourite shoes, the ones you can’t live without. Then the heels break or something happens that makes them unwearable. You will do anything to repair them and wear them again… or at least I did when one of my Doc Martens broke. Well, God’s love for us is infinite times more than that. It would have to be for Him to willing go through making Himself human only to die in the most painful way known to man. When we have a God who loves us so much that He made us in His image and made the ultimate sacrifice for us, it can seem impossible to ever return that love. How do you return the love that has saved you from sin? The reality is, you can’t. However, that doesn’t mean that we shouldn’t try. In fact, the Bible encourages us to love God… with absolutely everything. You shall love the Lord your God with all your heart and with all your soul and with all your mind. These two verses are basically the same. One is from Old Testament Law and the other is called by Jesus “The Greatest Commandment”. Then again, Jesus did love to quote Deuteronomy! Between them, God asks for our love in everything. Okay, He commands it, which could seem a little… or a lot harsh. Surely you cannot command love? Yet, as we have already said, God loves us beyond anything we can ever fathom. Personally, I do not need a command to return that love. The very fact that God loved me in such an unfathomable way means that I will do all I can to love Him back. We’ve already stated that obsession is when an idea or thought is so continually on your mind that it preoccupies you ALL the time. When the focus of your obsession is yourself, you become inward-focusing and selfish. 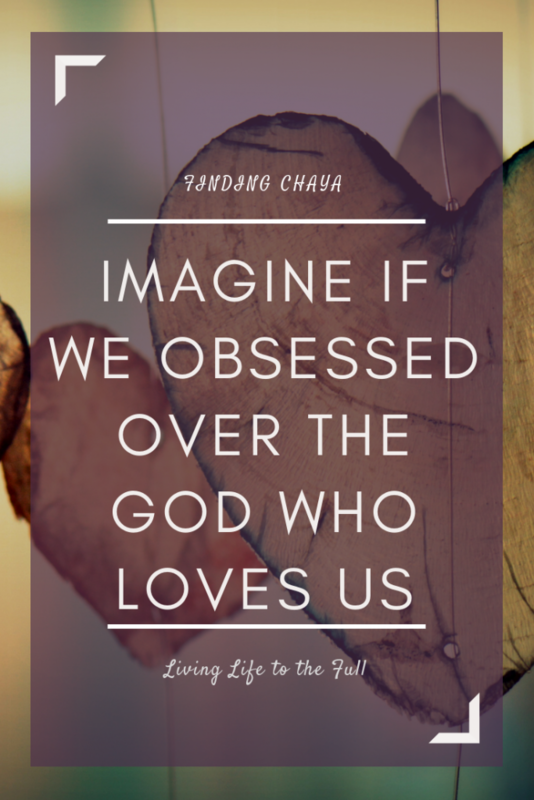 So what changes if we love God to the extent that it looks like obsession? Because that is what we are called to be. To love God with all your heart, all your soul, all your mind, and all your might is to love God with ABSOLUTELY EVERYTHING! Yet when we love God, our focus changes. It moves to God, to learning all that we can learn about Him. To knowing Him as much as it is possible, through prayer and Bible study and worship. The thing is, God is love. That’s why He is able to love us in such a foundational, unconditional, unfathomable way. So the more we love God and get to know Him, the more we are understanding what love looks like. As John writes in his first letter, love comes from God and is an integral part of who He is. Therefore, if God is love, as we allow God to preoccupy our minds then love will preoccupy us. Our lives will become about loving as God loves. Our focus shifts to look out and around us, asking where and how we can show love without expectation of gain or profit. 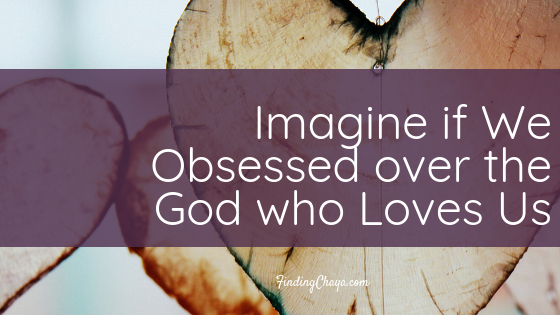 When we obsess over the God who loves us, we learn to truly love! I’m not planning to write a part 2 at the moment but who knows what the future holds.